A smaller scale version of our fabulously successful Round-Top Walk-In Chicken Coop™. 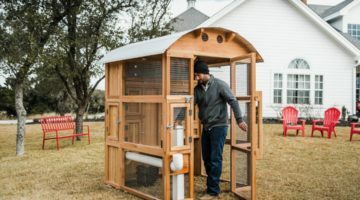 With 5’11” of door height and over 7 feet tall the Round-Top Stand-Up Chicken Coop™ has plenty of room for out of the weather hen care. Run, roost, egg box, water and feed are all sized to keep up to 6 full sized hens and still leave plenty of room for you too.